A practical one-on-one demonstration of theoretical knowledge, exercise mastery, movement teaching skills and problem solving skills with an oral defence (50 points). The written portion of the exam (parts 1 and 2) lasts approximately two hours in total, and part 3 lasts approximately one hour. The entire exam is worth a total of 150 points. To be certified, the candidate must pass all sections above with a minimum score of 80% per section. Your certificate from the USA is valid for 2 years. In order to maintain a high standard of education you are obliged to attend further continuing education courses (16 hours – 70% Polestar, 30% other providers). 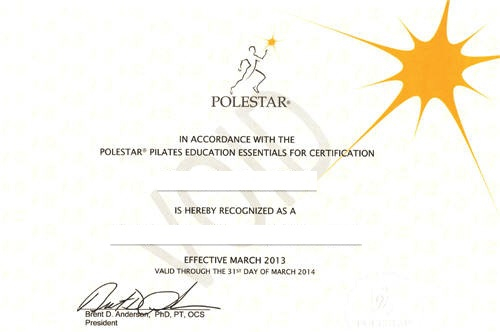 We recognize previous Pilates education with individual discounts on our programs. Please contact us to find out details.